I’m excited to announce the release of WebMatrix 3. 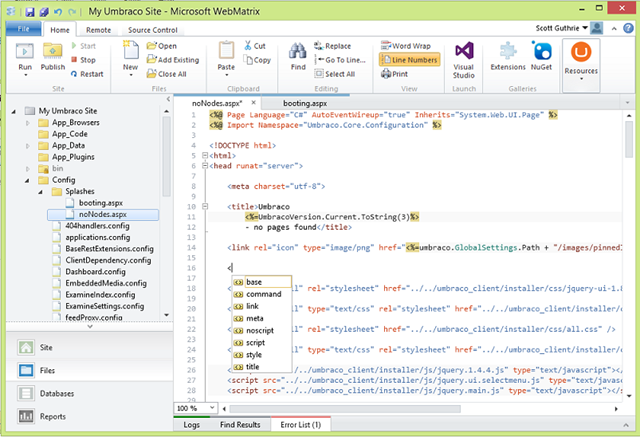 WebMatrix is a free, lightweight web development tool we first introduced in 2010, and which provides a great, focused web development experience for ASP.NET, PHP, and Node.js. Some of the highlights of today’s release include deep Windows Azure integration, source control tooling for Git and TFS, and a new remote editing experience. With WebMatrix 3, we are making it really easy to move to the cloud. The end result is a simple, fast and super effective way to edit your sites locally and host and manage them in Windows Azure. 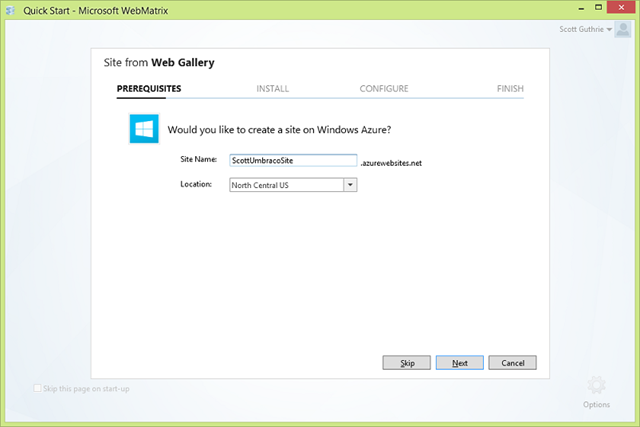 Watch this great video as Eric build a site with WebMatrix 3 and deploys it to Windows Azure. 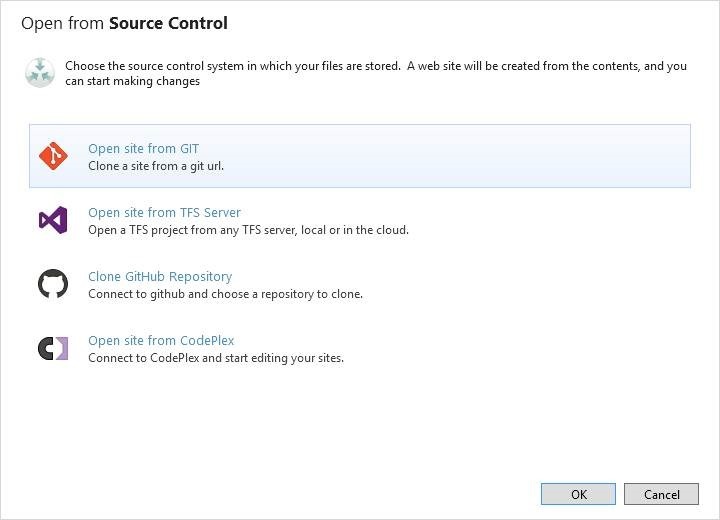 The TFS experience is focused on making common source control tasks easy. It matches up well with Team Foundation Service, our hosted TFS solution that provides free private Git and TFS repositories. While working with the remote site, IntelliSense and the other tools work as though the site was on your local machine. But when you save changes it pushes them directly to the remote hosted site. 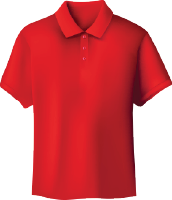 This makes it ideal for when you want to make quick changes in a hurry. 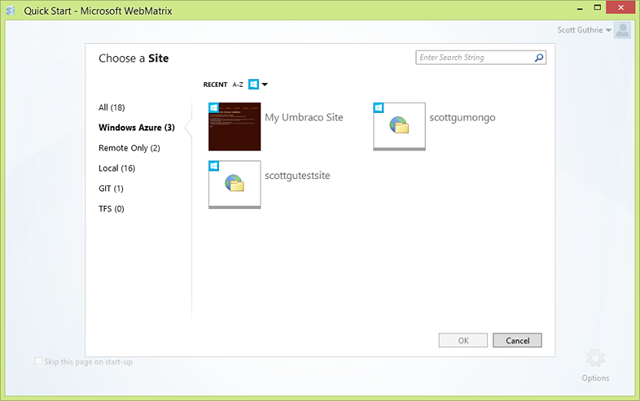 WebMatrix 3 includes a seamless experience for working with sites in Windows Azure, source control support for working with Git and TFS, and a vastly improved remote editing experience. These are just a few of the hundreds of improvements throughout the application, including an extension for PHP validation and Typescript support. We look forward to seeing what you build with the new release! 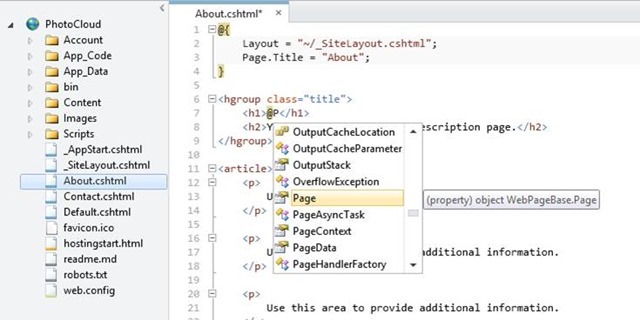 I'm sure this is a great product, but I wish MS would stop muddying the development waters with all these various overlapping dev tools; Visual Studio, Lightswitch, Access, WebMatrix, Blend, even SmallBasic. Is anyone actually using WebMatrix/Lightswitch in the real world? I would prefer MS to focus on ridding Visual Studio of its (many) bugs than constantly churning out new products (most of which will be dead and forgotten in a couple of years, if history is anything to go by). 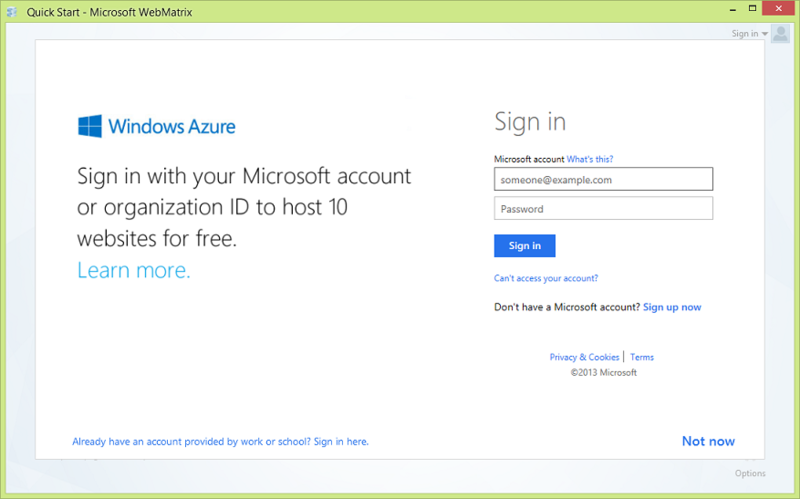 Error when signed in with a new azure accout. You should use DotNetNuke in your samples. Both source control and remote editing are great features! I think something to focus in the future probably should be the nodejs experience, I could never actually debug a nodejs app in webmatrix for instance, even with the plugins, never actually worked. Great job on these new things! That's great. WebMatrix is one of my favorite IDEs. I still run into an issue that people in the asp.net forums found. When trying to add data to an SQL CE database when you have a primary key and identity. It says the ID cannot be modified. Is this 'just' a wbematrix upgrade? Or is there anything new in the code 'asp.net web pages' or 'razor'? To summarize, this new IDE still works with the latest version of 'ASP.NET Web Pages 2'. Nothing new over there? I agree with LMK. Node.js is starting to catch my interest and I'm surprised that Web Matrix supports it out of the box while Visual Studio ignores it completely. 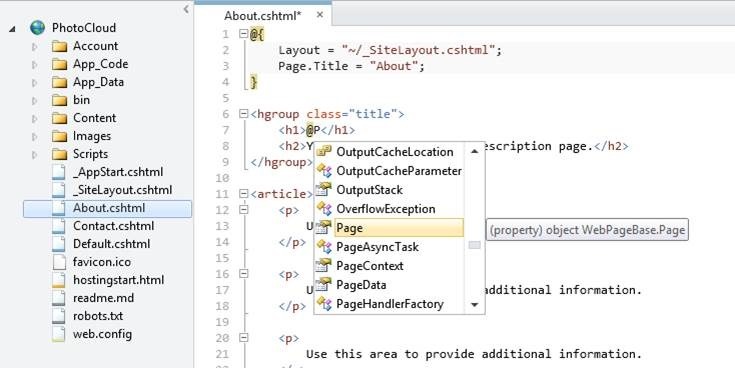 Are we doing the "VB.NET / C# divergence" from Visual Studio 2005 era again? What are the plans for Node with Visual Studio? 2) Is the $15 substantially more than I would pay elsewhere to host my site? 4) Would amazon accept domains from "azurewebsites.net" (as opposed to ".com" sites) when I sign up as an amazon affiliate (I will be "advertising" a few books of mine and family members on the "Contact" page of the site)? I don't know why they wouldn't, but sometimes companies are picky about such things. To answer an earlier commenter's question; I use WebMatrix nearly daily. It does what I need it to do and it does it well. I am not so worried about the Azure portion since I don't need it right now. I'm sure if I ever need it, whomever I will be working for at the time will foot that bill. WebMatrix is really nice. 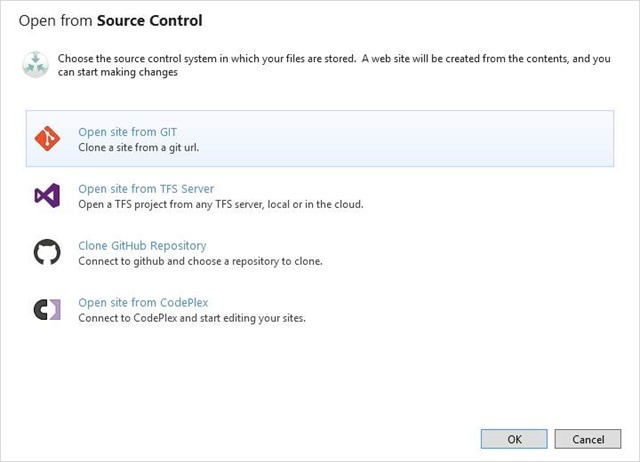 With Azure and Git/TFS integration I think it's one of the best all around IDEs available. It's really good if you want to go from development with source control to deployment. 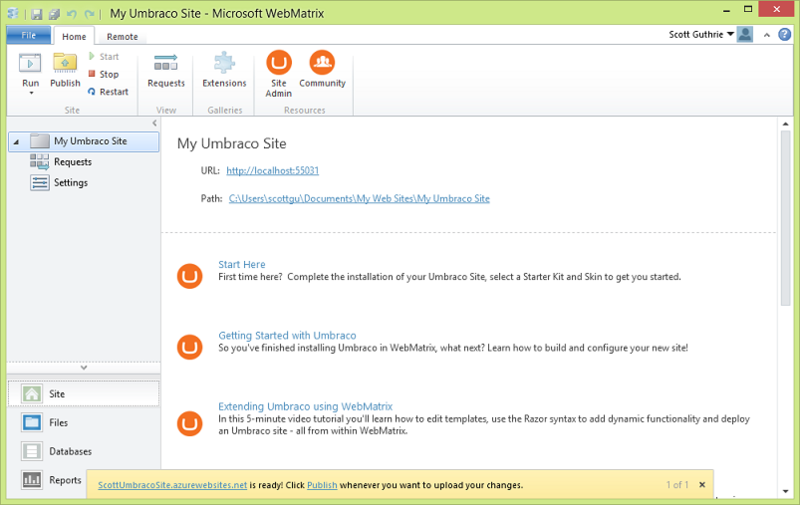 I think Microsoft needs to do a better job promoting WebMatrix and WebPages to developers. I find that not many developers know about WebMatrix and WebPages and many of the ones that do seem to look down on it as only for beginners or unnecessary without really knowing much about it. I think that attitude is unfortunate since WebMatrix is a really good tool for beginners, intermediate developers and even veteran web developers. It could be even better if there were a strong community behind it. This is really nice improvements, thanks! I really like how well you guys integrated this with Windows Azure. Will test later today, but looks really neat! How is this tool lightweight when is asking to install 85 MB of components, none of them optional. 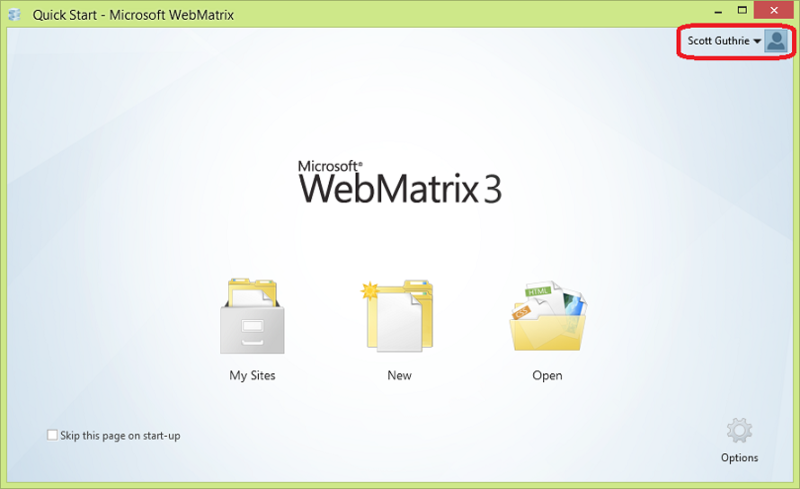 I think the new realease of Webmatrix 3 is a breath of fresh air! Bravo to MS! How does webmatrix relate to appfabric? Dependency on one another, not at all, completly ortogonal, etc? @Rafael Luna: MB is the new KB - don't sweat the small stuff! 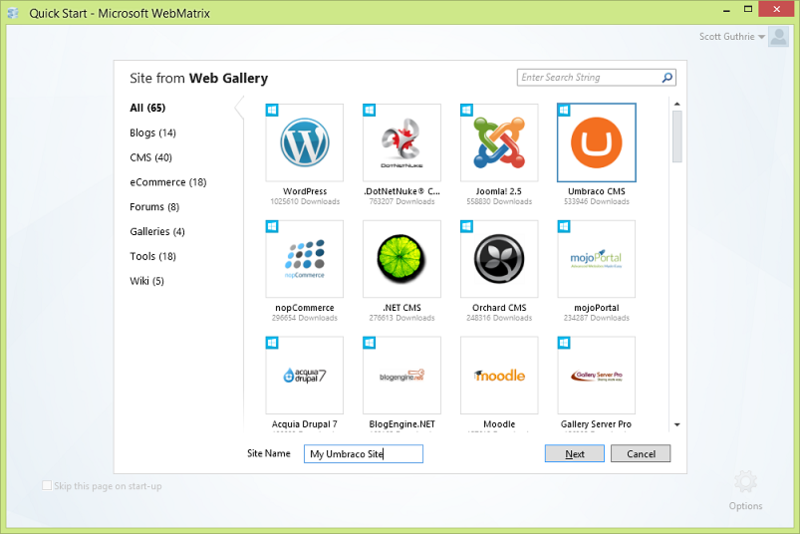 Why wasn't support for SVN added in WebMatrix inspite of users requesting it on webmatrix.uservoice.com? 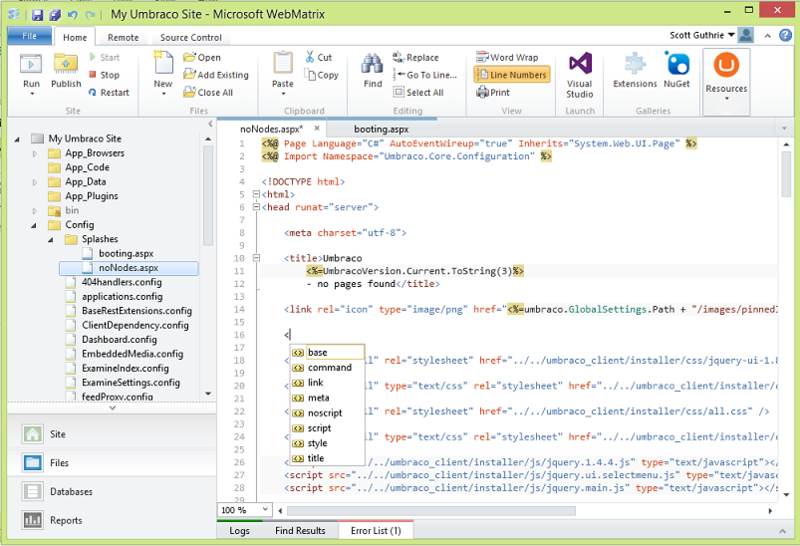 WebMatrix is a great IDE for developing nodejs stuff on Windows and we use it quite a lot. The only thing lacking for us in it is support for SVN. I am working on a offline mode for a project in C#. After disconnecting from internet also VPN Client is being alive for sometime for reconnecting attempt. In this situation all c# method says "Internet Connectivity State as True". I am using the below method to detect whether i am offline or not. The above method is giving status as True when I disconnect from internet and vpn client try to re-connect the server. Normally VPN Connectivity is not going to offline immediately after internet disconnects. VPN Client is taking extra 1 minute to change it status to fully offline. It tries to reconnect to establish a new connection in this time. In between, this 1 minute the above method gives InterConnectivity value as true. But this should give status as false. What is the best method or property to get the correct internet state on this situation? Or did I totally misunderstand something? Scott, its really commendable effort from you and your team to keep releasing new tools and updates at such a pace. But I have a genuine question, are we going to see future versions of ASP.NET [both webforms and mvc] and WEB API? It would be helpful to know about it from the long term perspective. >>>>>Scott, its really commendable effort from you and your team to keep releasing new tools and updates at such a pace. But I have a genuine question, are we going to see future versions of ASP.NET [both webforms and mvc] and WEB API? It would be helpful to know about it from the long term perspective. Next month at the Build conference you'll learn even more about ASP.NET vNext - lots of great things coming. Here is the error I am receiving. Your change could not be committed to the database.... The column cannot be modified. [Column name = ID]"
It looks like quite a few people are experiencing the same problem. I tried uninstalling-reinstalling WM3 and all Compact SQL db. But the error persists. I am seeing that this is a WM3 issue. I tried looking for WM2 but it no longer exists. Any idea when this will be fixed? There is a mission critical bug in WebMatrix3 related to saving publish settings with connection string info. The connection string info is not saving properly and publishes fail because of it. This makes it so that you cannot publish using web deploy method. This bug is being discussed on the web and I was wondering if there was a work around or a fix on the way? 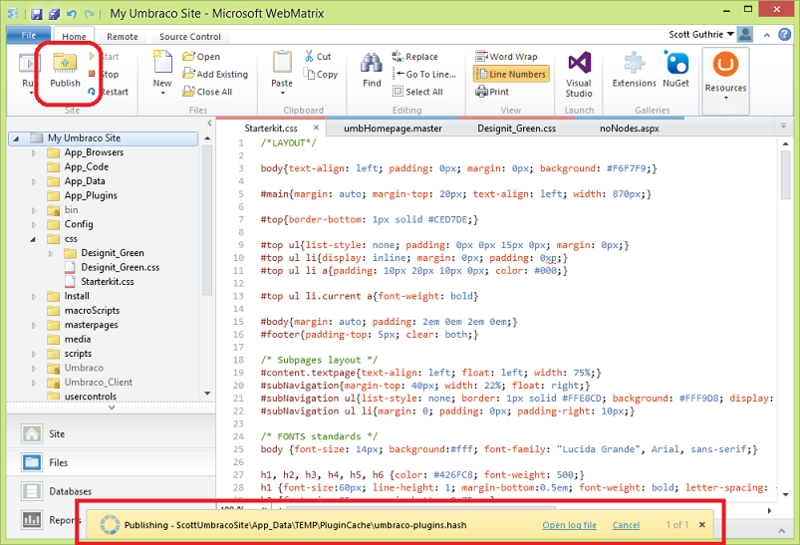 Love the Integration of SignalR in Visual Studio 2012 Update 2 and WebMatrix, Nuget. 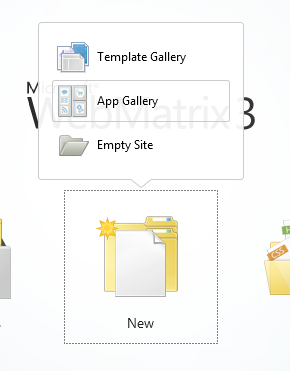 Several folks have complained of problems entering new rows into a database, using the GUI in WebMatrix 3. The typical case is when the user is entering a new row into a table that has an integer primary key with identity enabled. The user can enter the non-primary-key columns OK, but when it comes to the actual INSErt being executed, the GUI throws an error (cannot modify the ID column). This is a known bug. This is made worse by the fact that WebMatrix is touted as the solution for non-techies who want to get into data-driven website development. They typically start out with one or more of the tutorialsm each of which inevitably leads them to this error case, Then they are presented with a typically obtuse and unhelpful MS error message and a user quandry. No telling how many just throw up their hands and walk away from WebMatrix. The true solution is for MS to get off their collective duffs and test the entire produc against all the tutorials, identifying AND FIXING all the bugs so discovered! In the interim, tutorials should be modified to alert the user to this issue. Several work-arounds exist to using the GUI. One of the Best is Erik's SQL Server Compact Toolbox (sqlcetoolbox.codeplex.com). He pays more attention to QA issues than MS apparently does. So I downloaded WebMatrix3 and thought I would give it a try to redo my ancient Dreamweaver pages. Everytime I try to create a new site from a template (tried about 4) I get an error that the site does not exist. On the server it says it is created successfully, but there is no content. Has anyone tried this on a raw machine (no IIS, etc. installed). It just doesn't work.